On this day in 1781, Lord Cornwallis surrendered his army of 8,000 British, Hessian, and Loyalist troops to Continental General George Washington and French General the Comte de Rochambeau. 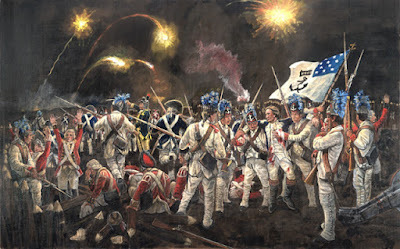 Yorktown is regarded as the last major battle in the American Revolution, for while there would still be other battles, Yorktown convinced the British government to come to terms with their rebellious colonies. 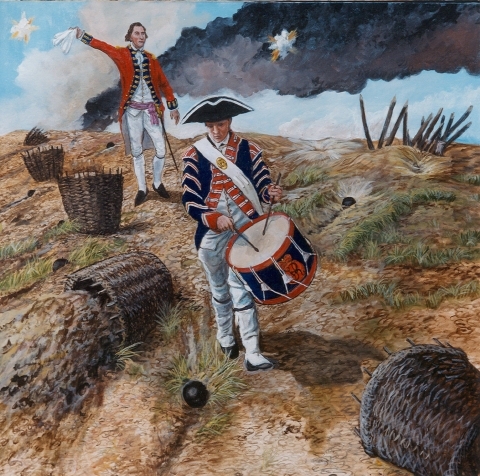 Painter David R. Wagner has painted a comprehensive series of paintings, tracing the routes of Rochambeau's French army from their initial encampments at Rhode Island to ultimate victory at Yorktown. These can be viewed at http://www.davidrwagner.com/revolutionaryrouteseries.htm With detailed historical research and a wise use of color, I greatly enjoy all of these American Revolution paintings. 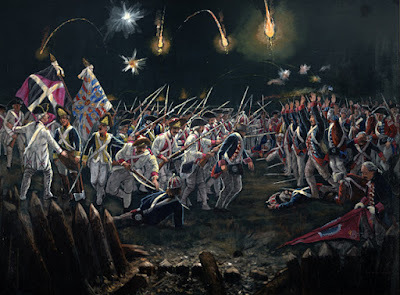 Because his "Revolutionary Route Series" contains over 50 paintings, I have spotlighted those that deal specifically with the siege of Yorktown. All descriptions are from his website. On October 3, 1781, Lauzun's legion clashed with British forces headed by Tarleton. The battle took place across from Yorktown on the Gloucester side of the York River. 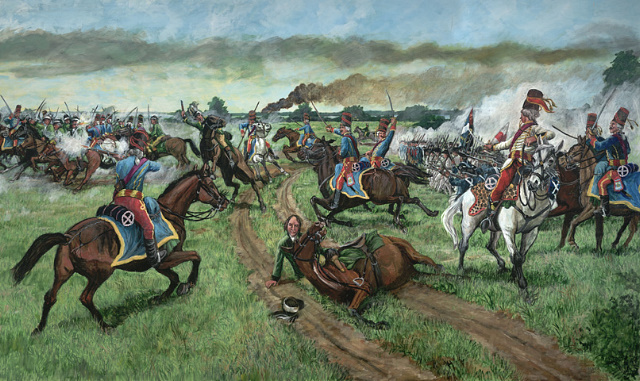 After a protracted engagement, in which the Virginia Militia were involved, the forces under Tarleton were forced to withdraw. It was a preview of the surrender of Cornwallis just 14 days later, bringing the war to an unofficial end. Although the Rhode Island Regiment was consolidated into a single unit in May 1781, the contingent of black troops was still called the "1st Rhode Island" and were commonly referred to as "Olney's Batallion." After dark on October 14, 1781, three days before the surrender of Cornwallis, the column moved forward in silence, muskets unloaded, bayonets fixed, in good order. Leading were eight pioneers with axes with the forlorn hope to be first through the cleared breach. With one man per company, then Col. Gimete (French officer) with five young officers in advance; next was Olney's Company and then the rest of the force. "When we came under the first of the abattis (logs and brush), the enemy fired a volley of musketry. The British continued to shoot, but aimed high. The pioneers then cut through the abattis. Olney moved past them, climbed the outer wall of the Redoubt, stepped on to the parapet between the two palisades. Twelve of his men followed closley. He called out, "Capt. Olney's company, form here." 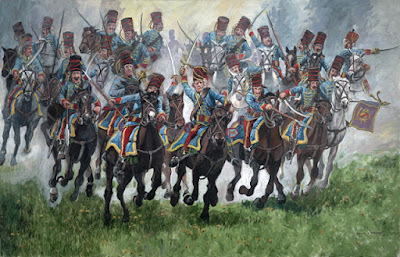 Six or eight British bayonets pushed at him. Some scaled his fingers, one pierced his thigh, another stabbed him in the abdomen just above the hip bone. Two of his men had loaded their muskets and came to the aid of their Captain, firing at the enemy soldiers attacking him. With this the redcoats ceased their assault; some ran away, some surrendered. The rest of the American force now entered the redoubt without opposition. The redoubt was taken in ten minutes. Lafayette praised very well known personages for their performance in the assault, but made only a cursory reference to Olney -- a situation occuring in all wars where the wrong people get the credit. Afterward, Gimete, the French officer, visited Olney in the hospital to say that Lafayette needed to rectify his omission; but the veteran Continental answered, "Let it go, the day is past." It was eventually brought to Washington's attention and the Rhode Island flag was ordered to be flown above the Redoubt through to the surrender a few days later.